By now, assuming that you’re following the guides for creating a Minecraft server, and using SpaceBukkit to control it, you should have an almost functioning server set up. The final thing that really needs to be done to get the server to be administered quickly is to complete the setup steps for the SpacePanel web site. Note:If you have been following the previous guide, then you will need to type “logout“, followed by logging in to the minecraft account that we created a little while ago. We will firstly need to create a symbolic link for the CraftBukkit server log file, as the location that SpacePanel looks for it is no longer correct. Type the following command, and then press Enter to create the link. 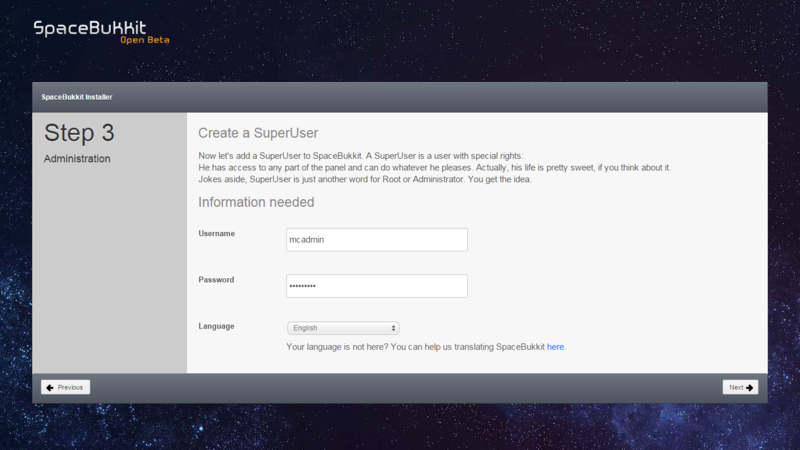 Start the CraftBukkit server by typing the below and press Enter. Wait for the server to start up… it will say “Done” when it’s ready. 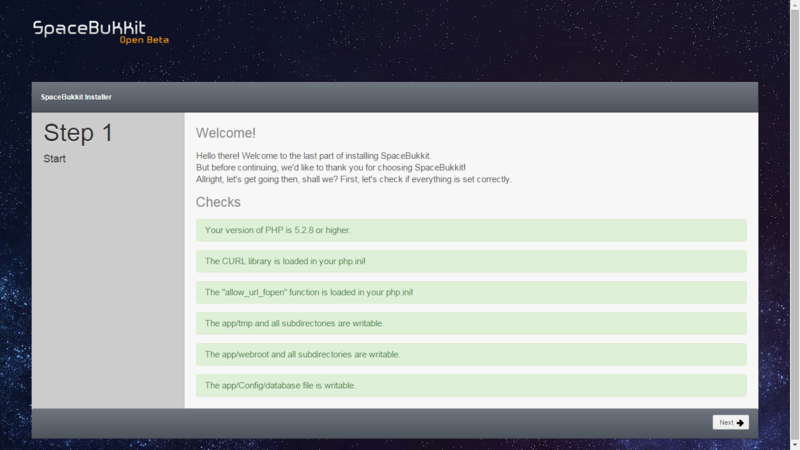 We can now move away from the server console for a bit, which means that you get to see pretty colourful stuff again. Open a web browser on any computer in your network, and go to “<ip address of server>/index.php“. 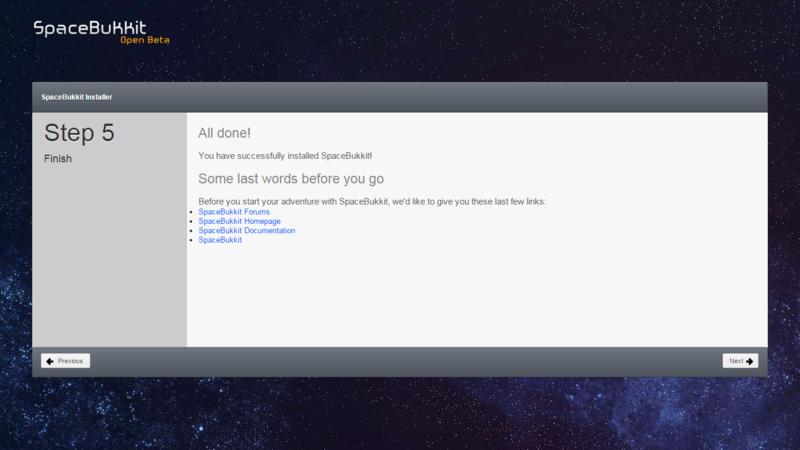 The setup page will load for the SpacePanel installer. Make sure that all lines are green (they should be if you’ve been doing everything in these guides), then press the “Next” button in the bottom right corner. 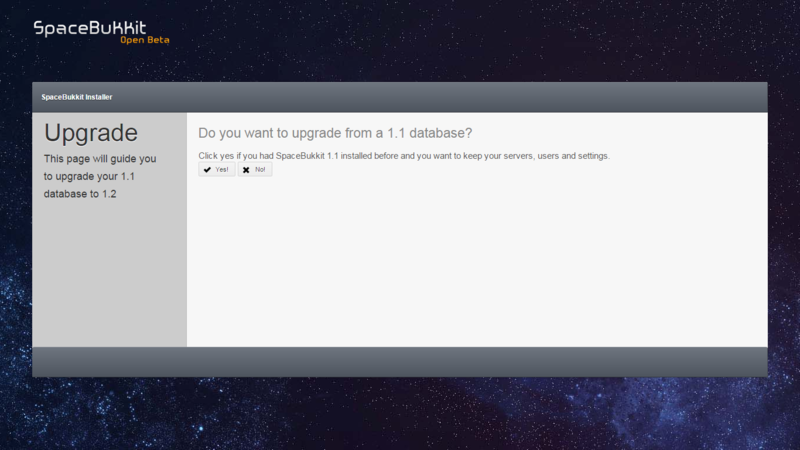 You will be asked about upgrading from a previous SpacePanel database, so press “No“, as we don’t currently have a database set up. You will now need to select a database type, as we already have a MySQL server set up, from the dropdown choose “MySQL“. Press the “Next” button once all of the information is filled in. 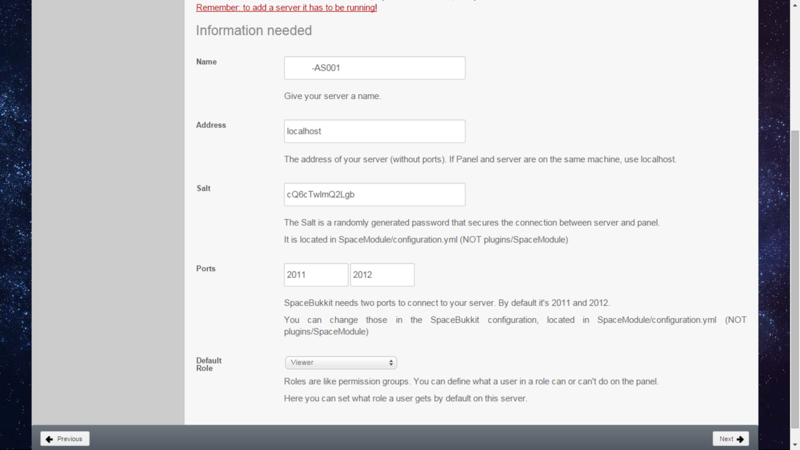 It is now time to create an admin account for managing the minecraft server. You can use the username “minecraft“, but I’m using “mcadmin“, as it’s possible to create accounts that don’t have as much power. Choose a password for this account, then press “Next“. When all of this is filled in, press “Next” to continue. If everything has worked, you will get a success screen. Press “Next” button to get to the log in screen. Log in with the “mcadmin” account that you recently created and relevant password then press “Login“. You may need to do this twice; I don’t quote know why this is. 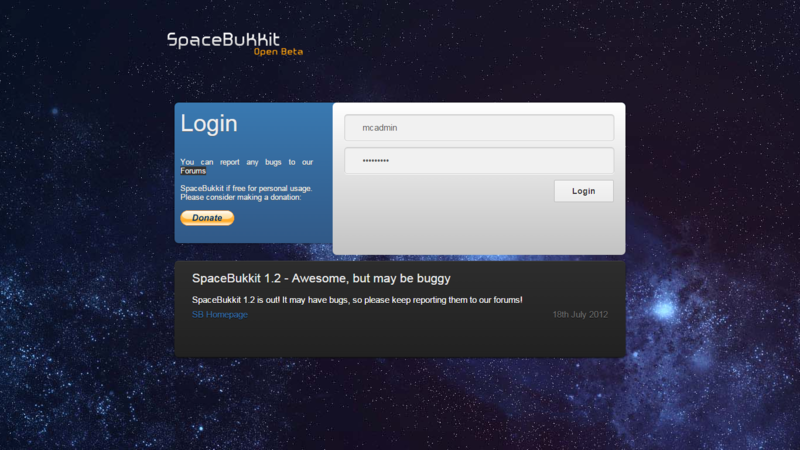 You will be logged in to the SpacePanel dashboard page. However, not everything is showing correctly. I’m not sure why. I can’t find any reasons for it happening on the Internet either. Don’t worry, as it’s fairly easy to fix. Log in to your webmin interface (https://<ip address of server>:10000) with the “administrator” user. 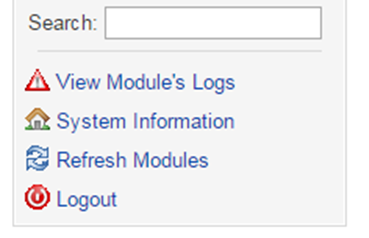 From the left hand side, click on refresh modules. It will take a few seconds to scan for all of the programs that it has modules for. Once the scan is complete, you will be told how many it’s activated. 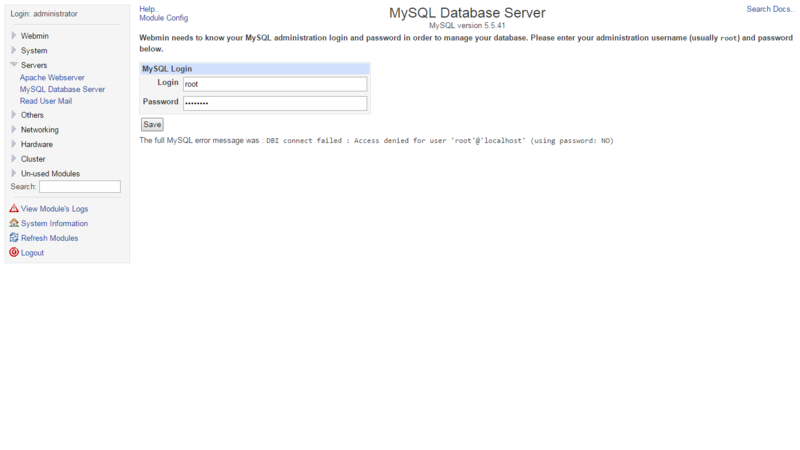 From the left hand side, click Servers > MySQL Database Server. 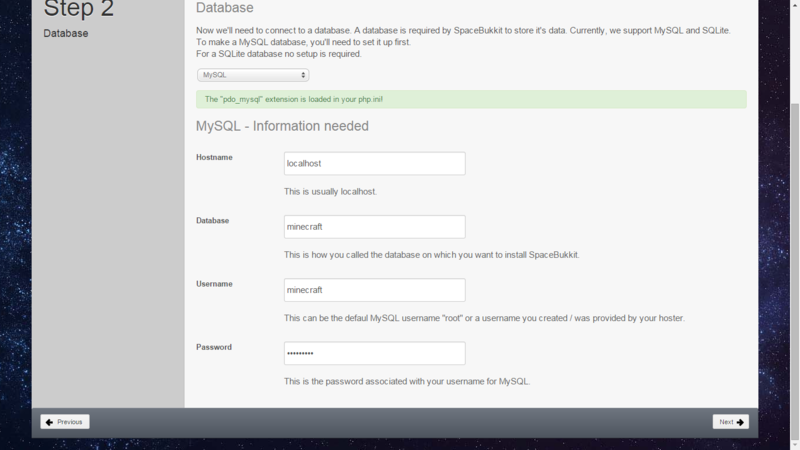 You will be prompted to type in the root MySQL user and it’s password, as Webmin needs this to control the MySQL server. Do so, then press “Save“. Once the server connection has been made, click the green “minecraft” folder icon at the top of the screen. When you are given a list of the tables available in the selected database, click on the “space_servers” green folder. 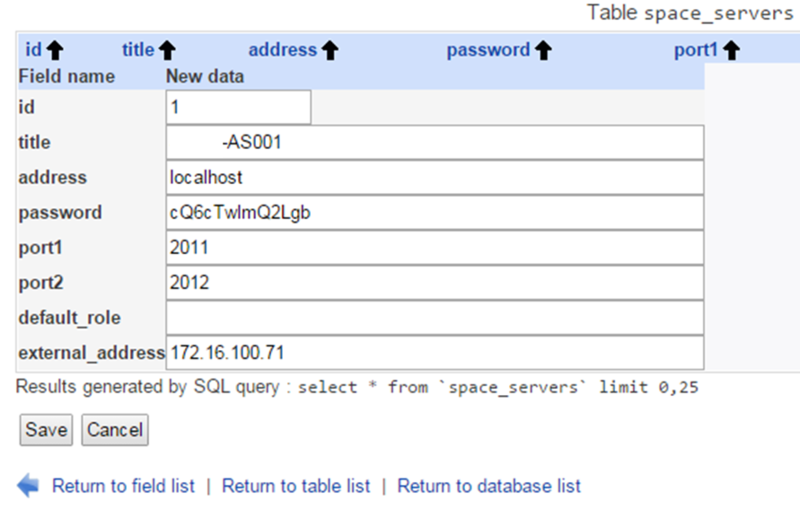 Choose the “View Data” button underneath the table listing the columns in the space_servers database table. Put a tick in the box next to the server row (you should only have one), then press the “Edit selected rows” button underneath the table. Retype in the password (which is the salt, which you still have written down somewhere I hope). Also change the IP address to an internal one if you’re only going to be running the server locally, or modify it to be an external one if you’re going to be forwarding ports, then press the “Save” button at the bottom. 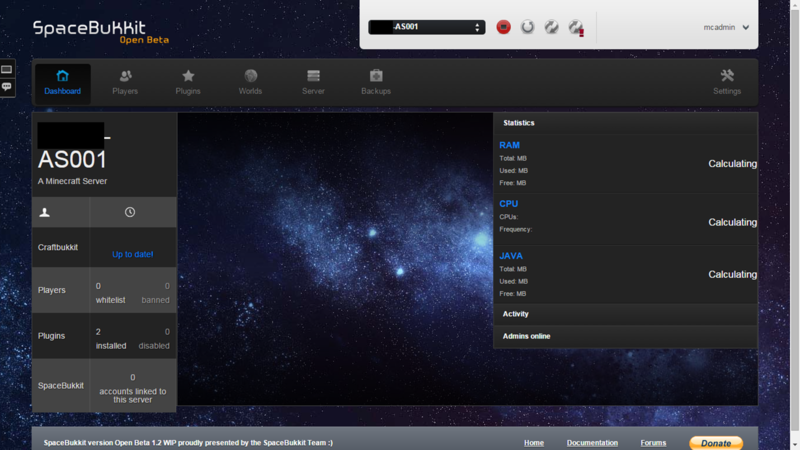 Go back to the SpacePanel dashboard website that you have open in your browser, and press the refresh button. The page will now load properly. There you go. That’s it. You’re done. Honest. Finished. Depending on what you wanted. If you want to have a Minecraft server that is available to be administered through a web browser, that’s exactly what you’ve managed to achieve. All that you need to do is remember to log in to the minecraft user account on the server and type “./rtoolkit.sh” to start the server. 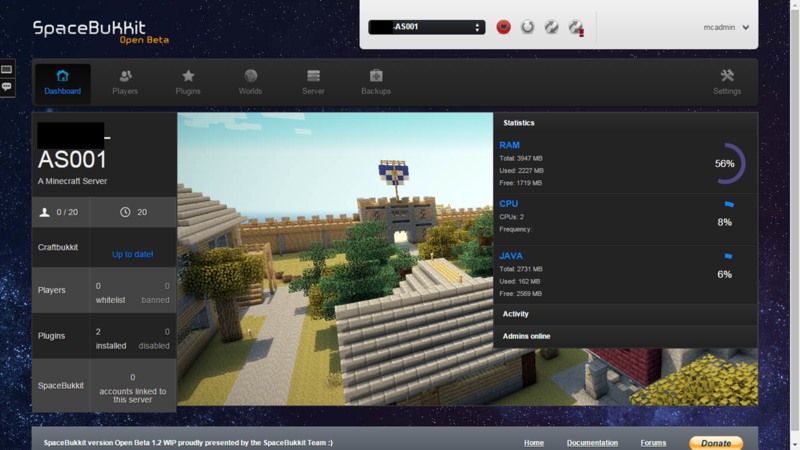 Then, on your Minecraft game, use the direct connect button and type in the IP address of the server. Then enjoy! If you want the Minecraft server to be a bit more useful on its own (such as broadcasting itself to the LAN and starting when the server itself starts up) then you’ll need to keep reading. But for now, and the next few hours, your Minecraft server beckons. Posted in Guides, Network Management. Tagged Minecraft.